Hi, my name is Callie! Don't see a skill or technology you're looking for? I'm willing and eager to learn new ones. A few of the projects I have worked on and completed over the past year. 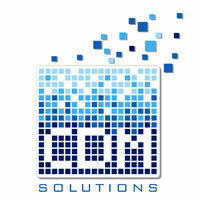 I work diligently to provide my clients solutions that not only improve processes but also exceed their expectations. Supported, developed and edited content for a proprietary POS software, digital signage, and websites for customers in the US and internationally. Identified and developed processes to improve company development procedures. Improved google ranking by creating a new marketing strategy and materials for company product website. Over 7+ years experience working remotely for clients in the US & Australia. Facilitate client meetings in person, via phone and Skype. Researching, developing project plans consistently delivering within budget and meeting deadlines. Guide and inform clients throughout the project progress; fielding requests for changes. Troubleshooting technical and user issues, creating user friendly documentation resolving issues or escalating to appropriate team. Document processes, issues and all aspects of projects to simplify future work, code reusability, and collaboration. Established a standard QA process where none existed. This reduced issues and downtime resulting in client happiness! Devised detailed test scripts enabling us to squash bugs before deploying new sites or changes to production. Developed a solid incident and problem management framework allowing us to quickly mitigate issues, perform root cause analysis and eliminate problems. 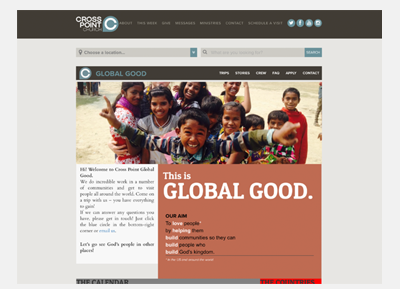 Edit and integrate themes and plugins utilizing HTML, CSS and PHP. 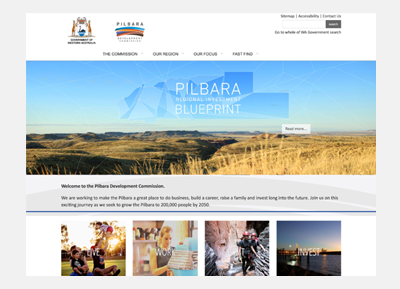 Analyze and implement changes to specific areas of their website. Worked with other technical staff to understand needs and challenges. Built custom web templates to solve various needs and simplify processes. Delivered updates and fixes using HTML, CSS, Java Script and Angular JS code. Setup audio, visual, and computer equipment for live productions. 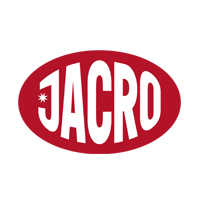 Troubleshoot and solve problems as they arose, developing processes to prevent further issues. Recruited, mentored and led a team of 15 tech and media volunteers. 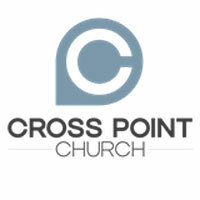 Assisted the Worship Leader including recruiting, auditions, training, and scheduling new members. Established training material, led one-on-one training and held team learning events. This vastly improved the quality of live productions and team moral. Held team building activities strengthening relationships and minimizing attrition. Created standard operating procedures (SOPs) to simplify routine tasks. Helped with brainstorming to come up with creative and impactful productions, teaching topics, stage design, audio/visuals, web/media, promo materials, etc. Composed weekly newsletters to communicate accomplishments, goals, and updates to my team. Orchestrated, edited, directed, and produced video productions. Led my team to collaboratively standardize the setup/tear-down process associated with live events/productions. Spear headed a multi-million dollar capital raising campaign. 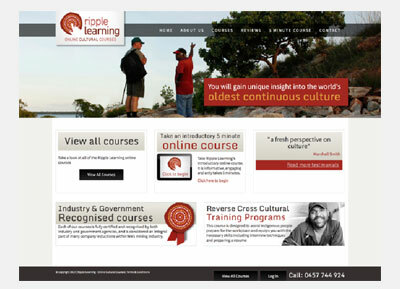 Including building a website, designing print media, live events and video productions. Interviewed clients to gather personal health history in compliance with HIPAA. Identified posture imbalances and fitness abilities to formulate fitness plans. Communicated clearly and adapted my language to each clients' understanding. 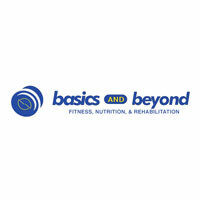 Designed and led fitness programs for individuals/groups tailored to abilities. Created a healthy living curriculum, taught groups and gave "lunch-and-learn" seminars at local businesses. Provided diet recommendations and nutritional counseling for healthy choices. Created healthy eating/cooking classes, demonstrated and taught cooking techniques and healthy recipes. Thanks for visiting! Please use the form below or contact me via Phone to discuss how I can best serve you! 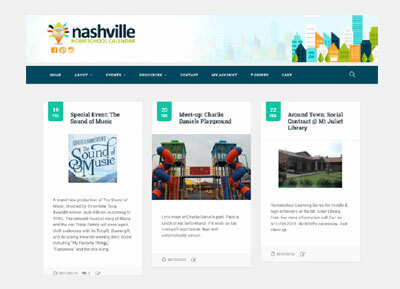 Nashville Homeschool Calendar (NHC) consists of a leadership team that researches, books, and organizes field trips to various locations for members at a discount, to enrich homeschool curriculum. Initially NHC was using Facebook and Google Docs to handle events, but it quickly become unmanageable. Noticing their struggle I offered my services to transition them to an event management platform. Since we launched NHC has gone through two phases of development due to membership growth and the business evolving. Phase One: Researching what products would best meet their needs and solve their problem, I presented the options available. 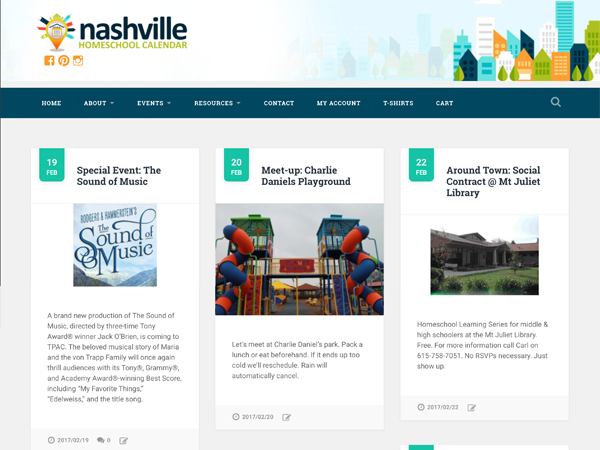 NHC selected Wordpress CMS + Events Manager & Events Manager Pro. I created the template HTML & CSS to reflect their brand and customized Events Manager to handle her unique fee structure: a per event fee . Launch day was a great success and saw a huge growth in members attending events and was much more manageable than Google Docs & Facebook Events. Phase Two: While Event Management had improved, NHC noticed certain features lacking and wanted to implement membership levels to better serve their members. This next phase also had to include content trickling based upon membership, discounts, and an inclusive e-commerce solution that could handle high volume and would grow with NHC. Once again back to the drawing board I researched and evaluated the options. NHC selected The Events Calendar to handle their event management and WooCommerce to handle their commerce and membership. Initial setup included creating custom templates, modifying the existing theme template HTML, CSS to support both solutions. After successfully building the templates the plugins setup and WooCommerce customized to allow her unique fee structure. 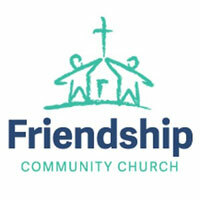 Launch day saw over 3000 hits, and 300+ users accessing the site, providing tech support via Facebook, phone and email. 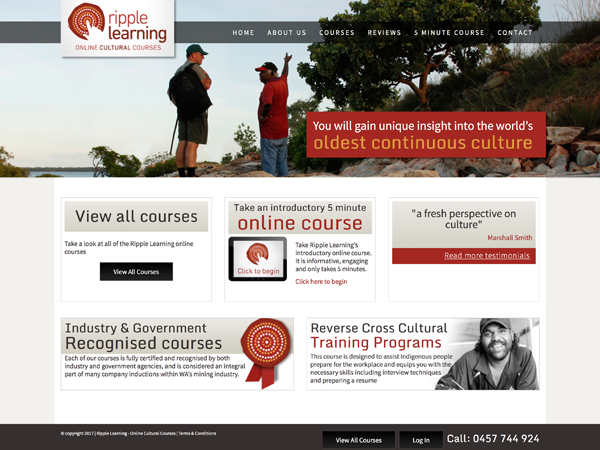 Ripple Learning had their developer resign and left them with a non functioning website, I was assigned their project. After evaluating the documentation and necessary plugins, I determined the plan of action and was responsible for ensuring it was executed. Grassblade was installed, setup, tested on their server, and necessary plugins were repurchased. After testing was completed, we addressed the clients dislike for their demo setup which required guests to login. A simple modification of the allows their guests to now access their demo with a single click. Also, after having successfully proven my problem solving and programming skills, I was asked to develop their audition page. 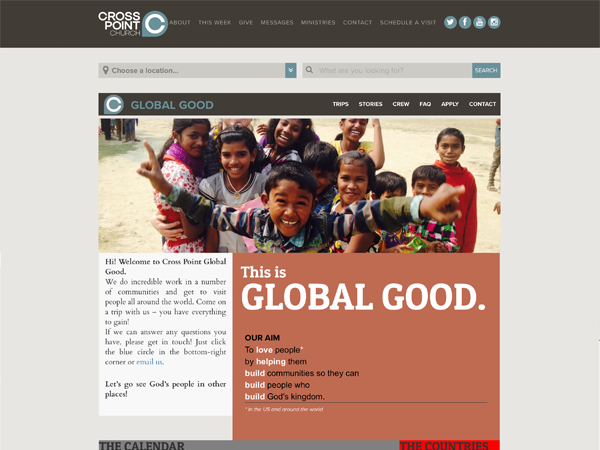 I was given a PDF from the creative team and built the page with HTML & CSS within their CMS. 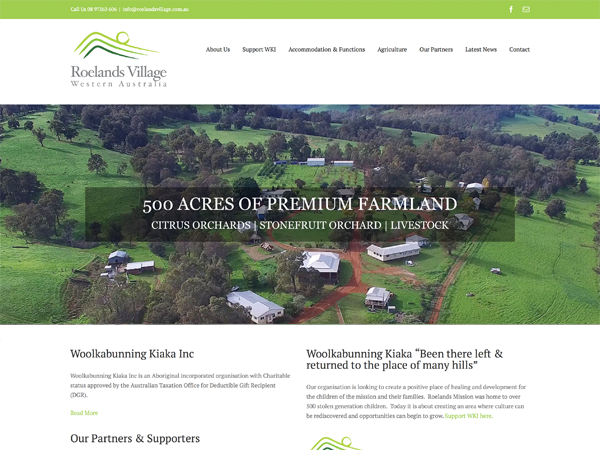 Roelands Village had a Wordpress site they were unable to edit. As the in house wordpress expert, I made the changes they required. Our team then migrated them to Concrete5, and assist with media and content management as needed. Shot In Oz is a collaborative project. 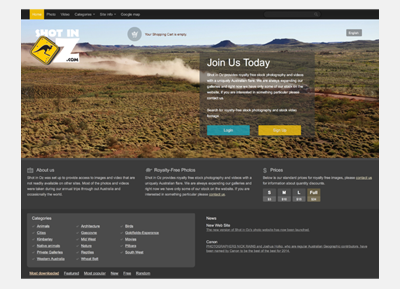 We wanted to create a stock photography website that specializes in Australian photography. 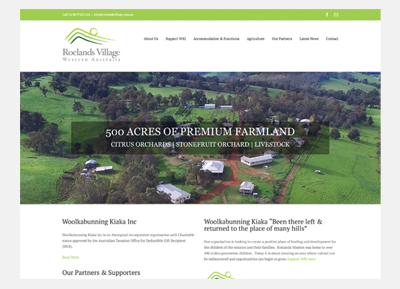 Highlighting Australian landscapes, flora and fauna. 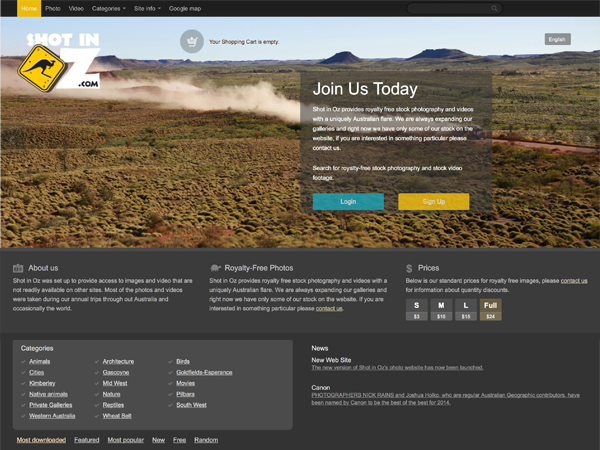 We have gone through several phases of development and are now using a custom CMS for photography sales. 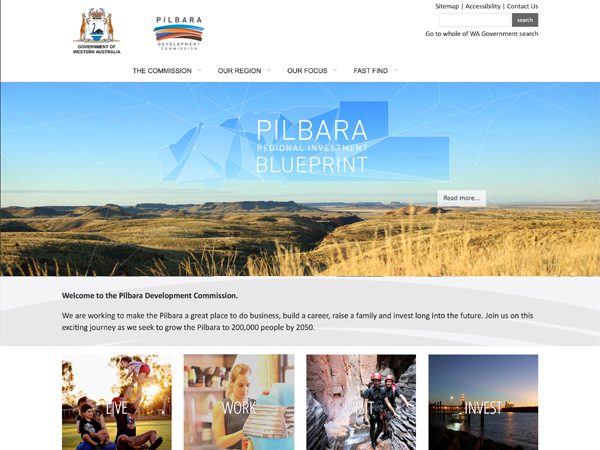 Pilbara Development Commission website required a web accessibility audit. I was responsible for going to each page, documenting any conflicts or issues per the guidelines set out by the Western Australian Government.